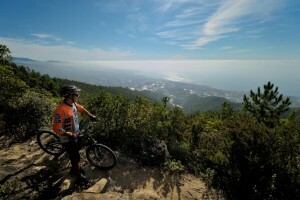 Book the MTB Course Weekend for a great opportunity to discover the wonderful scenery of the Maritime Alps, with bicycle itineraries that are absolutely unique, where you can ride along paths that start near the beaches of the Ligurean Sea and climb to peaks of over 2000 meters in altitude. Our guides, experts in mountain biking will lead you on the discovery of valleys and mountains that frame the famous Riviera of Flowers. You’ll be able to enjoy unique natural panoramas, visiting thousand year old medieval villages and tasting delicious products that are typical of Ligurian cuisine during your cycling holiday. After an initial day of orientation, when you will be offered the possibility of making contact with the Riviera by pedaling along the Cycle Path, on the following days the itinerary will be adapted according to the abilities of the group. The level of each stage is indicated in the schedule of each excursion. Arrival in the early afternoon in San Remo, and for the more enthusiastic, the possibility to do a brief training run on the beautiful cycle path that runs along the sea up to San Lorenzo. Accommodation at the Nyala Suite Hotel. Free for dinner. After dinner we suggest an evening stroll through the illuminated streets of the city, or as an alternative trying your luck at the gaming tables at the Municipal Casino. Return to hotel and overnight stay. Along the Imperia side the first part of the climb winds on asphalt roads up to the church of St. Brigida, and beyond that onto a dirt road. You will have the possibility of reaching the summit, where on clear days there is a breathtaking view (1149 m.). A visit to the “Casone dei Partigiani”. Descent in All-Mountain style by single track or by a dirt road. Meeting point: Sferisterio Piani (IM) at 10:00, return scheduled for the afternoon. There are architectural attractions to be seen while passing through centers like Sasso, the Principality of Seborga and the historic center of Bordighera Alta. Visit to the Blancardi Biodynamic wine company. Impressive scenery along the sandy firebreak trails, where you catch brief glimpses of the beautiful sea view, surrounded by low vegetation. Finish at Capo di Sant’Ampelio and the famous church. After a hearty breakfast, the morning is free for you to discover the wonders of San Remo, the old port, the magnificent gardens of Villa Ormond and Villa Zirio, the famous Villa Nobel and the elegant streets of the city center. Departure for place of origin. * in case you are travelling alone, you can choose between a single room or being accommodated with another participant. Round trip travel, transfers to the places outlined in the program, except where otherwise indicated, and anything not included in “Our offer includes”. Lunches and dinners must be selected according to the daily menu or the tasting menu proposed by the chef. Beverages and à la carte food must be paid on site, except where otherwise indicated. Equipment: protective helmet obligatory, possibility to rent one on site; possibility to hire bicycles on request. Available for consultation at the site: doctor, physiotherapist, bike mechanic etc.